There are many ways to get involved and raise funds for La Vida. Whether you are going on an adventure trip, running a marathon, climbing a mountain, selling your art or even hosting a coffee morning, we are grateful for your support! Please create a fundraising page through BT MyDonate. This is an efficient way to collect Gift Aid on the donations you receive. For a UK tax payer a donation of £10.00 could be worth £12.35 to LA VIDA under the Gift Aid scheme. 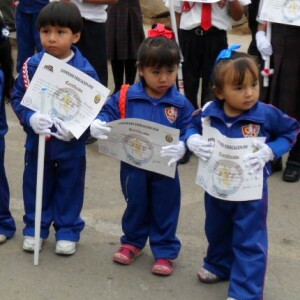 We also have a Sponsor a Child scheme set up with the Villa Maria pre-school in Lima, Peru. easyfundraising.org.uk is a great way to raise money for La Vida just by shopping online. You don’t pay anything extra. It’s completely free and easy to use, and there are nearly 3,000 participating retailers like John Lewis, Amazon, Argos and Expedia! Join for free and next time you shop or book your holiday online, the retailers will donate a percentage of what you spend to La Vida for free! There are no catches or hidden charges and La Vida will be really grateful for your donations. Make your page as compelling as possible by adding your own photograph and text. Make sure your page communicates the reason you have chosen to raise money, and why you believe La Vida deserves support. Be creative! Before sending an email to your entire address book, ask your closest friends and family to donate first. An empty page can be a little intimidating, so do make sure to capture a couple of donations before contacting your entire list of potential sponsors. People tend to match the amounts already listed on the page, so do target your most generous supporters first! Email your family, friends and colleagues with a link to your page, but don’t forget other groups of potential supporters: former colleagues, old school and college friends, fellow members of a church, club or PTA — you may be surprised how many would like to sponsor you. Encourage them all to pass on the message to anyone else who might support your chosen charity. Also think of those people living in different parts of the UK or abroad. The Internet is global — so make the most of it! Publicity in the local media can be an invaluable fundraising tool. A few lines in the local paper, or an appeal for sponsorship on your local radio station, can yield amazing results. You know what it’s like – people mean to donate, but sometimes they don’t quite get round to it on the first request.Encourage people to re-visit your page by regularly updating it. Change your picture, post updates on your progress and, if you are taking part in a sporting event, keep a training diary. Let supporters know how much you’ve raised so far. An email update is interesting for those who’ve already supported you and a nudge for those who haven’t. Because you are already familiar with your own email system, you can set up groups and you’ll be able to send more emails at once than you can via your sponsorship page. Some of your potential supporters may feel more comfortable opening an email that comes from you personally through an email address they recognise. After your name and title etc, add a line at the bottom including the address of your web page. This will raise awareness of your event and ensure every email you send has the potential to prompt a donation. A monthly donation of £17 provides quality education for a child at Vila Maria, Lima, Peru. Sponsors receive information on the child they are supporting and regular updates on his or her progress.